We’ve all done it. We’ve complained for four months a year about the cold. And the ice. And the bleak darkness. And the misery. But now folks, it’s time to put all that behind us and embrace winter in a new way. Winter After Hours is a social get-together event spearheaded last year by Volume One and Eau Claire Parks and Recreation to promote all the phenomenal winter-based activities available to Chippewa Vallians, all in one space. 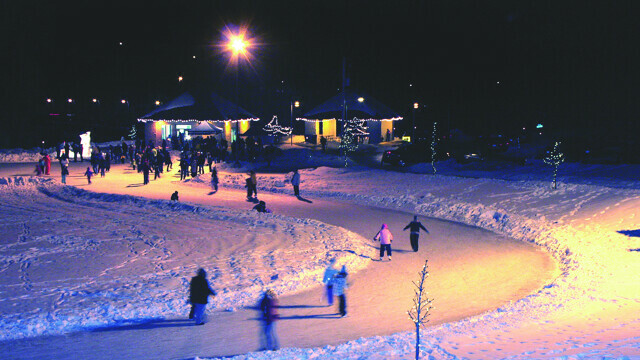 There’s a whole myriad of things to do under the twinkling lights of Boyd Park: there’s skating on a curvy ice loop, snowshoeing on a torch-lit path, kubb on a snow island, mind-boggling snow sculptors at work, festive music, hot beverages, a fire pit, and more! Don’t have skates or snowshoes? No big deal, you can rent some. Don’t like the cold, but want to be social? Boyd has a warming house, a blazing fire pit, and hot beverages. Essentially we’ve considered all your excuses, and now you have none. You have to come, if only to try a Swedish lawn game in the snow or to see international award-winning snow carvers in action. You could cozy up on the couch and watch Elf for the umpteenth time, or you could come out, meet your neighbors, sip some hot chocolate, and maybe get in a snowball fight. This year the series is sponsored and made possible by Hillside Dental, Smiling Moose Deli, Eau Claire Ford, and more.